In the field of global climate change, scientific bodies often are accused, even by those in power, of fabricating data. But such criticism is often deeply flawed. Take those sceptics, for example, who believe that climate change is occurring, but because of natural – rather than man-made – causes. If one argues that data has been fabricated to show warming where there is none, one cannot then also imply that warming is occurring after all, but naturally. Either there is warming or there is not. Similarly, Flat Earthers who state that images showing Earth's curvature are due to the shape of a camera lens, themselves believe in a disc which by definition has a curved edge. A major part of the scientific anthropogenic climate change argument is that there is an increase in temperature extremes in both summer and winter. Evidently, a Flat Earth model cannot support this; in fact, the most accepted Flat Earth model, which maintains that the sun rotates in a non-variable circular orbit over the flat disk, implies that there should be no seasons at all, let alone multi-decadal seasonal extremes due to climate change. Nevertheless, to quote Shenton: "Climate change is a process which has been ongoing since (the) beginning of detectable history, but there seems to be a definite correlation between the recent increase in worldwide temperatures and man's entry into the industrial age." In this instance, the president of the Flat Earth Society is correct. Anthropogenic climate change sceptics, on the other hand, are often willing to accept the science behind the Earth's natural cycles, which they blame – instead of human activity – for the world's weather woes. Clearly, we again find an implicit difference of opinion between a Flat Earth model, and a non-anthropogenic climate change one. 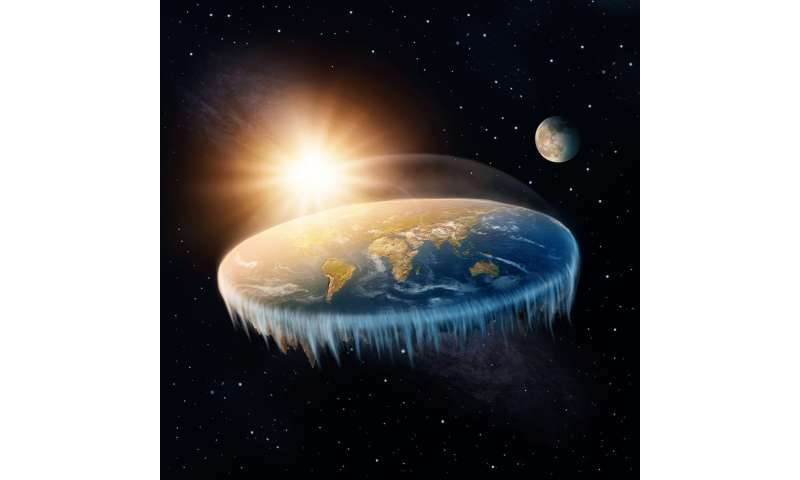 It is also clear that many climate change sceptics believe in the (approximately) spherical Earth, even if only subconsciously, by their use of scientifically accepted global maps when discussing data – not to mention when calling it "global" warming. But the problem isn't likely to go away any time soon. The US has the highest number of believers in both flat-Earthism and anthropogenic climate change scepticism, and the UK is not far behind. The US also has a high number (more than 50%) of senior political figures who deny man-made climate change, not to mention a democratically elected leader vocally believing the same. There are also numerous well-known celebrities who question the established shape of our planet. In today's complex world of social media narratives, the engagement of scientists with the public is more crucial than ever. Thankfully, current funding for public engagement training and activities is accessible to scientists with a passion for communication and conversation, enabling them to communicate facts rather than "fake news." "Flat Earthers vs climate change sceptics," also known as, "Dumb and Dumber." Since flat earthers and climate deniers are already contradicting *themselves* in their claims - small wonder they are contradicting each other. Sometimes I think the US is the worlds biggest open asylum (since these conspiracy theories - from climate denial, to flat earthers to alive Elvis/Hitler/Kennedy/whathaveyou seem to be almost exclusively a US thing).. There must be something so wrong with their education system. AAP, you are overstating your case here. It seems to me that people all around the world have a large variety of unsupported beliefs with varying degrees of silliness. One particular problem we have here in the U.S. is the pervasive climate change denier propaganda supported by the almighty oil industry, e.g., the Koch Bros. and their ilk. The Republican Party is their puppet which adds apparent legitimacy to these obviously false beliefs. I have often wondered how many Republicans were suffering from cognitive dissonance when their homes were flooded by the third 500 year flood in three years during Hurricane Harvey in 2017. To begin with, an act of deception by conventional "science". Note the constant suggestion that some form of personal issue is at the root of espousing "conspiracy theories". In fact, many promote certain ways of thinking simply for personal power, assembling groups of people who agree and are willing to be told what to think. Many others do, indeed, accept what can be called competing ideas because they don't trust authority, because, face it, those in power are only there for their own enrichment, they've betrayed the best interest of the populace time and again. It seems safer not to truth them in anything. Interesting that the article does not invoke the "explanation" from only a few years ago that those who accept "conspiracy theories" are looking for simple answers for situations that are complex and, in the end, random. Remember when organized crime tried to say all criminal acts were unrelated? and what about them aliens ? lol , and what about neo marxists and antifa and the establishments now attempted coup against Trump , What about the fall of Europe ? What about snow in May in France ? what about political agendas driving BS 'science articles. what about lying ? ^^^^^^^What about trying to make sense? You know, when they start writing sociology studies about your conspiracy theory it's pretty much jumped the shark. Wow, an article about the weather in France. You do understand the difference between local weather and global climate? Probably not. This is hilarious. Scientists contradict each other all the time and even fight over their pet theories. We're all just human. It's normal. They don't have to make sense, @jonsey, they're nutjob conspiracy theorists. I notice we're no longer talking about the article. Now we're talking about extreme weather, a prediction of climate change no matter how much the climate deniers lie about it. I'm not sure that's the problem. We do have a Republican party that's doing it's damndest to destroy public education in the US, but it's still not bad. The problem, I think, is that we have (and have had for some time) a culture that seems to believe that education is a bad thing. Hell, in the US, "elite" is used as a pejorative. When I lived in California, it was easy to forget how willfully ignorant the people in this country are. Since I've moved inland, I'm sometimes amazed that we're able to accomplish anything at all. There's the famous story about Somoza the elder-- dictator of Nicaragua-- being given a tour of the many clinics and schools in the more enlightened and neighboring Costa Rica. He snarled something to the effect that "I don't need educated peasants. I need oxen." Rather than rejecting consumerism it seems to me the rest of the world is following suit. You can lead a person to knowledge but you can't make them think. And most people don't want to; it's hard for them. Just be-LIE-ve in jebus and that the Earth is flat and that anyone who's different is an enemy. And butthere'snoglobalwarming. Science ; the universe was created in a flash from nothing and we have to change our sinful ways or we will all roast to death . Hmmm, and its right and proper to equate AWG skeptics with flat earthers , maybe climate scientists equal catholics . Obviously they didn't have a very good science program at your gradeschool, @snoose. And you didn't get any further than gradeschool. You managed to get everything you mentioned wrong. axemaster, I have to believe this is a vast exaggeration. I have never met anyone that was functional in our society that held that belief, let alone one out of six people. One of my favorite pictures from space is the Earthrise picture taken by Apollo 8 in 1968. One look tells you the Earth is round. The fact than a fairly average person could save up some frequent flyer miles and fly around the Earth themselves on a commercial airline to prove there is no edge is compelling evidence. @Mark, your confidence is based entirely on anecdotal evidence. In fact, over 50% of people believe in one or another conspiracy theory. I know many, and the conspiracy theories they espouse range from 9-11 to the Kennedy assassination to global warming to flat earth to UFOs to chemtrails to the Illuminati and Freemasonry to vaccines to fluoridation to MKUltra to RFID chips to HAARP and far beyond. False thinking usually involves ignoring evidence, and often uses false logical procedures; the most common false logic presented ultimately boils down to "there's no evidence against it." If we cannot fix this I think that we will become extinct by the actions of a few insane individuals convinced they are saving the world by destroying it. At the recent Flat Earth Conference in the States, people FLEW IN from Europe. That is, to get to the conference itself, they engaged in an activity that proves in multiple ways that the Earth is round. It didn't phase them. Which just goes to show that once people have decided something is true, nothing can dissuade them. Even looking out a window at a curved Earth while navigating using GPS. Because they have a crap education system? And were settled by a bunch of people whose religious views were considered loony tunes in Europe even 200 years ago? Who knows? They certainly throw up their fair share of loons, though. And extremely clever people, as well. A shame that they have to work in such a backward country. Maybe somebody can add to this; I live in the UK. I have also lived in New Zealand. I would suggest that the percentage of religious belief in both of those countries is very low. I know very few people who are not atheists. What is the experience of US posters on here? I find it weird that people actually still believe that nonsense in this day and age. How do you get round it? Do you admit to being an atheist? Not a problem in the UK, or NZ, or Europe. In fact, you would be considered a bit strange to be doing a science course whilst still believing in religious woo. We clearly still fail miserably at teaching critical thinking skills in school. simply providing knowledge just isn't enough. What is the experience of US posters on here? I find it weird that people actually still believe that nonsense in this day and age. How do you get round it? Do you admit to being an atheist? Not a problem in the UK, or NZ, or Europe. I guess one also has to differentiate between "belonging to a faith" and "believing in that faith". There's plenty of people that go to church on sundays or are 'christian' because "it's the thing to do", "my parents were" or "church is the place where some acquaintances show up" but nothing else - even in Europe. Do you admit to being an atheist? I find it even weird that one has to. It's like having to admit that one doesn't believe in unicorns. Atheism is like breathing - you're born to it. No need to profess to it. @Mark, your confidence is based entirely on anecdotal evidence. Yes, but they are my anecdotes. I am not much of an amateur astronomer, but I know a few things, have a decent telescope, and have even taught children (Cub Scouts) on occasion. I enjoy showing people of all ages the planets and I am looking forward to observing the perihelic Mars opposition this summer. People have asked why the planets are all round, but nobody in my entire life has ever challenged me by asserting the Earth is flat. I suppose you might argue my sample size is too small to be statistically relevant, but there must be some correlation between a lifetime of interactions and reality. The schools here require science, including Earth science, and go well beyond Earth simply being round. ''@Mark, your confidence is based entirely on anecdotal evidence. In fact, over 50% of people believe in one or another conspiracy theory. I know many, and the conspiracy theories they espouse range from 9-11 to the Kennedy assassination to global warming to flat earth to UFOs to chemtrails to the Illuminati and Freemasonry to vaccines to fluoridation to MKUltra to RFID chips to HAARP and far beyond. False thinking usually involves ignoring evidence, and often uses false logical procedures; the most common false logic presented ultimately boils down to "there's no evidence against it." What is the experience of US posters on here? If there is one place you do not want to paint with a single brush, it would probably be the U.S. The range of diversity here is astounding and probably greater than anywhere else. We do seem to have more people here in the U.S. who are religious, but most are pragmatic and are not as religious as the media would have you believe (pun intended). Mainline Christianity here is mostly distilled down into being a useful, moral person, and does NOT try to convince you that all the world's creatures are descended from pairs on Noah's Ark. Of course born-again Christians and some others do believe just that. I have run into a small percentage of people who literally believe everything in the bible. Years ago I tried to use evidence and logic to convince them of things like the world is considerably older than 6,000 years, with little success. You might find it interesting that on one occasion I appeared to make some headway countering the 6,000 year universe age fallacy by pointing out that everything we see beyond 6,000 light years disproves that. For example, every Hubble picture of every galaxy outside our own proves the universe is a lot older than 6,000 years. Under the right conditions you can see the faint glow from the Andromeda Galaxy without a telescope. That light originated about 2.5 million years ago. Jonesdave, I see that you lived in New Zealand. Any other comments on that experience you are willing to share? I spent two weeks in New Zealand as a tourist and thought the people and the sights were both wonderful. I will always have a warm spot in my heart for New Zealand. Da Schneib> You can lead a person to knowledge but you can't make them think. And most people don't want to; it's hard for them. Just be-LIE-ve in jebus and that the Earth is flat and that anyone who's different is an enemy. And butthere'snoglobalwarming. It is not hard for people to think - it's hard for people to think as Da Schneib, or jonesdave or any one you choose to act as a teacher, but teach them individually how the they think individually, as no two people think the same, you will find you can lead them to knowledge and make them think! Wow. It's nice to see a really good discussion on human fallacies in belief systems. Is climate change and flat earthism learned or inherited? Is a a nature vs nurture thing? Are political beliefs linked. What I have noticed in climate change is nearly all Democrats support the scientific methods of logic, experiment, observation, and analysis. Republicans are somewhat mixed. The majority of climate change deniers are Republican but there are some republicans that are not climate change deniers. I have a similar observation about flat-earthers but the ratios are different favoring republicans even more. In general all anti-science attacks (like attacks on teachers for example) are politicized from far right sources. Wasn't the Dems and Retards once united on science, truth, justice and the American way? It depends on where you are. On the west coast, I had no problems being an atheist since it's pretty common there. I now live in New Mexico and I avoid all religious discussions. I work at a government lab (very conservative), surrounded by other scientists and engineers, and I'm always surprised when someone talks about their religion. The ubiquity of churches and the religious mindset here means that I don't fit in well on a personal level, but that doesn't hurt my professional work. Can't wait for retirement though (9 more years). You would all be quite surprised, or at least I was, to realize how many functioning, seemingly normal, intelligent people there can be in careers that require higher education, who harbor any number of flavors of irrational and delusional belief systems. Anything from creationism to psychotic levels of paranoia and conspiracy theorists can be found among professionals with engineering degrees. Education along with reasonable levels of intelligence can definitely co-exist with psychosis in humans.